Ivory Keys are a special type of key in The Division 2 which unlock a box in the White House (see screenshot above). To unlock the box you will need to find 8 of these Ivory Keys and although this may seem like a lot of work the contents of the box when it is unlocked makes the effort worthwhile. Inside the box you will find the Shield Splinterer - F2000 assault rifle, which has a gear score of 250. You will also obtain a white weapon skin, and the Hunter's Axe backpack trophy. If your weapon of choice is an assault rifle you will be particularly keen on getting the F2000. Check out our guide below on how to get Ivory Keys. 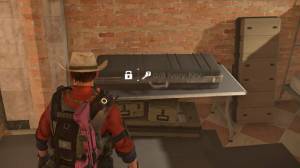 The box which the Ivory Keys unlock can be found on a small table in the Base of Operations. To find it enter through the main White House entrance and walk past the Quartermaster and Vendor before turning right (this is also the same place where you will find the Barber once you get him). Getting the Ivory Keys is not an easy task, it requires taking down Hunters, which are level 35 secret bosses and difficult to find without a guide, these are the same bosses that reward you with the 12 masks. Before the first major Division 2 patch on launch day (Friday, March 15th) you could obtain 8 Ivory Keys by jumping into another players game and killing the Hunters that you had already killed in your own game. This has since been patched out to prevent players from farming Hunters multiple times. Killing Hunters in another players game will now only reward you high-end loot which means you have to kill 8 different Hunters in your game. There are 12 Hunters you can kill and not all of them drop Ivory Keys, only one Ivory Key will drop per encounter. Unfortunately at the time of writing there is some confusion, only 7 Ivory Keys have been found. The Ghost hunter isn't being triggered correctly which means it will not drop an Ivory Key, and only the final hunter you kill from the Midas/Revenant and Death/Phantom/Cross/Diamond encounters will drop an Ivory Key. This guide on how to get Ivory Keys in The Division 2 will be updated when this issue has been resolved. Check out our Masks Locations Guide to find the whereabouts of the Hunters which drop the Ivory Keys.